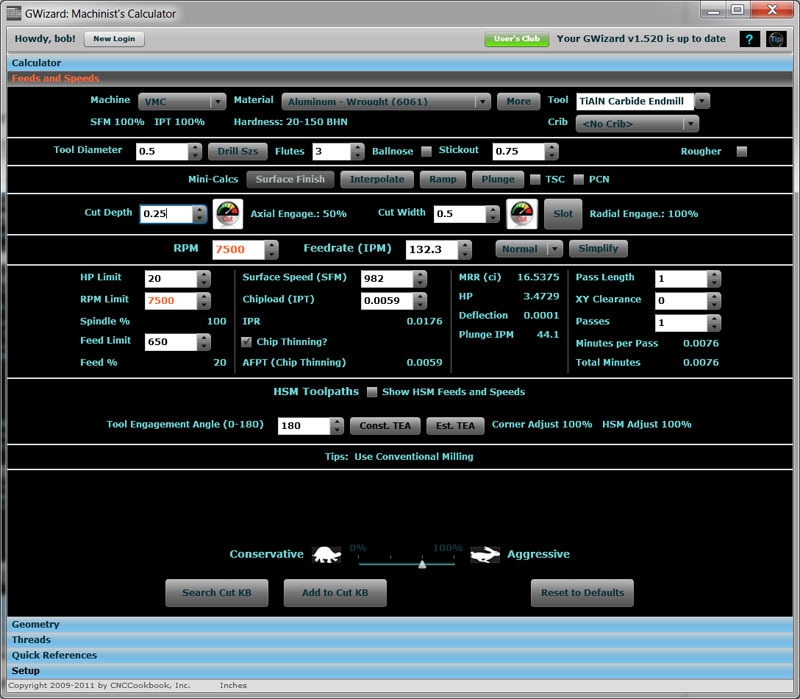 I’ve just finished adding a new feature to the G-Wizard Calculator that I call “Mini-Calcs” for release 1.040. Mini-Calcs are little popup feeds and speeds calculators for special situations. We already had one popup for calculating ballnose cutter stepover to achieve a particular surface finish. I’ve just added two more–one is all about interpolated holes and the other is about ramping. Both are common CNC operations that may be used to get a cutter down into a pocket or in the case of interpolation, this is an effective way to use an endmill to create a hole of a particular size. 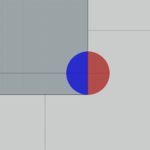 There are a lot of trade-offs around making holes with interpolation, but more on those in a moment. Let’s start with the Ramping Mini-Calc. From the screen shot above you can see I’ve set up an aggressive machining scenario in 6061 aluminum. I’ve got a 1/2″ 3-flute TiAlN Endmill selected and it’s a serrated “corncob” rougher to boot. I want to set up my CAM program to cut a pocket on a part, and I’ve decided my entry to the pocket will be via ramp. I’ll show how to use the Ramp Mini-Calc to solve a couple of interesting problems. As you can see, with a 3 degree ramp, the adjustment in feedrate is pretty minor, from 108.6’ish IPM down to 106. No biggie, in fact we could probably just choose to ignore it unless we’re running a really max’ed out feedrate we’ve determined through trial and error to be right at the ragged edge. The Ramping Mini-Calc figures the ramp angle at 14 degrees. This is more aggressive than the 3 degrees we had earlier, so we have to cut our feedrate from 108.6 IPM down to about 97 IPM. That’s starting to be worth worrying about in the CAM program. 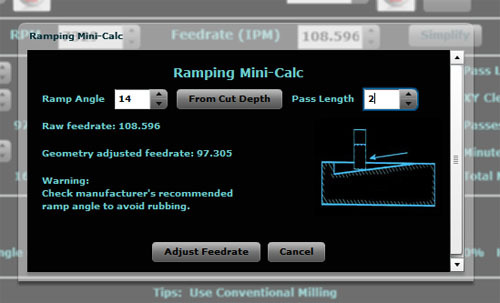 You can just click “Adjust Feedrate” and the Mini-Calc will override G-Wizard’s default calculated feedrate based on the new information on ramp angle. This is a probably a good time to mention the warning you see there. Not all cutters can tolerate arbitrary ramp angles. For example, let’s say we had a 90 degree ramp angle. That would be a straight plunge. Obviously if you don’t have a center-cutting endmill, that’s a no-no! Insertable tooling will have a ramp angle limitation that you can find in the manufacturer’s catalog. It’s often pretty limiting, so be sure you don’t find out the hard way you have exceeded it! There’s quite a bit more going on here as you can see. First, you’ll need to specify whether you’re machining a hole or a boss. This determines whether the endmill is going around an ID or an OD diameter. 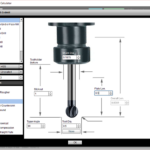 In addition, the checkbox tells whether Tool Comp is in use, in which case the toolpath is the cutting edge rather than center of tool. We also need to tell whether we will be doing a Helical Interpolation (going down the hole in a spiral) or a Circular Interpolation (just machine from center out without changing the Z depth). Lastly, we enter our Feature Diameter, which we said would be a 2″ hole. – The raw unadjusted feedrate coming in from G-Wizard is 108.6 IPM again. – Since we’re doing a Helical Interpolation, there is a ramp angle. We figured it out from the Cut Depth parameter. You could also have used the ramp calculator to go from degrees to cut depth. – We need to adjust for the geometry of both the ramp and the fact that unless we have tool comp on, our feedrate is based on a radius that is either larger (boss) or smaller (hole) than our feature. As we can see, the geometry adjust feedrate is signicantly different in this case, coming in at 77.8 IPM. What’s all this business of acceleration? Thought you’d never ask! Not long ago I was chatting with a moldmaker about the pros and cons of interpolation versus a honking indexable drill to open up a hole before pocketing. He wasn’t having any of it because he needed a bunch of hole sizes in his molds and he needed them to be done accurately via interpolation. And, he wanted G-Wizard to do the interpolation calculations, and BTW, the feedrates it was giving him were too fast for his machine to interpolate accurately (I related the story in more detail in a prior blog post). After thinking about the issue for quite some while, I finally realized the answer to the accuracy issue was in figuring out the acceleration required for the op and making sure it was within the machine’s capabilities. As you can see, the operation depicted by the screen shot requires 0.03 g’s of acceleration, which is 4034.5 inches per minute per minute. That’s not very challenging for most machines. A high-end machine purpose-built for HSM with linear servos may be able to do 5 g’s of acceleration. The vast majority of machines are only capable of a tiny fraction of that kind of performance. You can check your manufacturer’s specifications, but I have more bad news–the exact acceleration capabilities can vary fairly significantly from one machine to the next, particularly if they’re not right off the assembly line. 1. Pick a test diameter. Smaller is better because its easier to generate higher accelerations going round and round real fast in a little hole! 2. 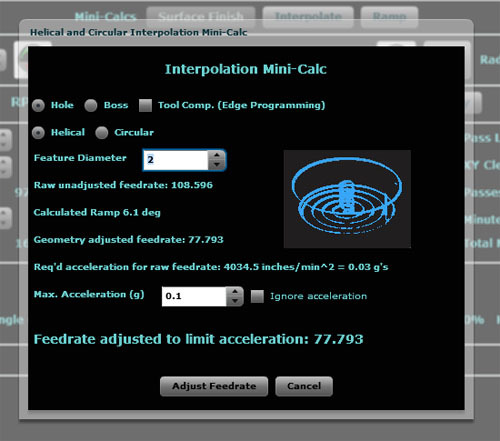 Set up the Interpolation Mini-Calc for circular interpolation on your small hole. 3. Now go run tests on your machine until you’ve figured out the fastest feedrate that interpolates that hole accurately. Plug that feedrate into the Mini-Calc and it’ll tell you how many g’s that was. Write that down! Eventually I will add a field to the Machine Profiles in G-Wizard so it’ll remember it for future interpolation calculations. Just as an example, let’s say we machine 1/2″ bosses with a 1/4″ EM. I like bosses for these tests because we can get a micrometer on one to accurately measure it. Holes are more trouble. Given a Cut Depth of 0.2″ and a 15% of diameter Cut Width for that boss, G-Wizard has us going round and round at 178 IPM on our 7500 rpm limited spindle. That gives us an acceleration of 0.3 g’s. Believe it or not, that’s probably heading into the pain threshold for an older VMC that doesn’t have the swiftest rapids in the Wild West. So let’s say we wind up having to slow it down to 120 IPM before we hit our tolerances. 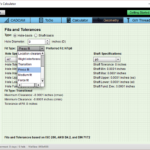 With just a little fiddling in G-Wizard around the Interpolation Calculator, we discover that means our limit is 0.15 g’s. If you’re just hogging a hole to get a pocket started, don’t sweat the acceleration limits. There is a checkbox to turn the feature off. Incidentally, going around a corner on a toolpath will be subject to the same kinds of acceleration limits. You’ll want to map these limits out for a couple of hole sizes to see how stable they are for your machine. Keep careful notes, they’ll come in handy when you’re trying to dial in that high dollar job. Okay. 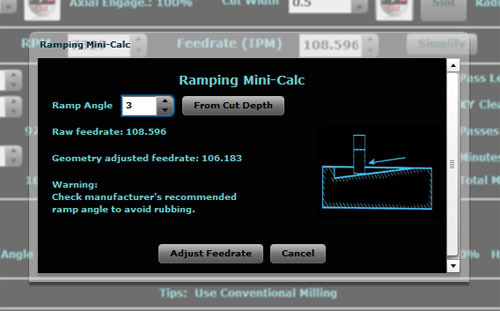 You’ve now seen how we can use the Ramping and Interpolation Mini-Calcs in G-Wizard to solve some interesting machining problems. Go forth, be fruitful, and make some chips!